Today, I am going to make an observation, elaborate about it a little bit and then I am going to leave the floor open to you. I want you to prove my observation wrong. To tell me I’m mad. Blind. Living on another planet. I want you show me that the slices of the industry I see this condition in are not really representative of the bigger picture. Because as far I can tell, what I see is pretty prevalent. My observation is based on what I see at the wineries I work with, the industry people I speak to (both local and international), what I see on social media and the things I read about South African wine and our industry. Imagine, if you will, a basic X/Y axis: the Y-axis represents the level of excitement or motivation (on a scale of 0 to 100) and the X-axis represents the progression of time (in a non-specific unit – could be days, weeks, months – no matter) from 0 to infinity. 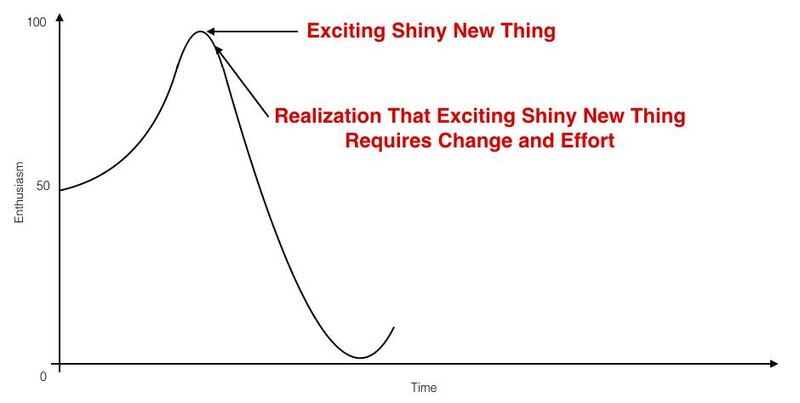 The condition I am diagnosing our industry with is best described by a graph starting at time = 0 with a y-value around mid-point on the excitement scale – let’s say 50. 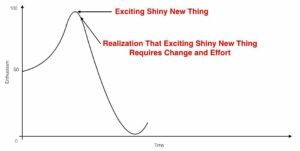 A short time later – at the exact time that some exciting new idea or plan is introduced, the excitement level spikes to nearly 100. Shortly thereafter – at the exact moment the level of effort required to make the exciting thing happen is realized – enthusiasm drops precipitously towards zero. Occasionally (depending on how essential the original plan or idea is), enthusiasm may climb ever so slightly – just enough to complete the proposed task. This condition affects all sectors of our industry – from sales and marketing, to management, to the tasting rooms. It is often debilitating. It smothers innovation where it lies. It stunts growth. It demolishes fresh ideas. The condition is pervasive. And yet I see clear and obvious root cause. The cause seems innocent enough; nothing too sinister. Yet harmful if left untreated. It’s worse than apathy, because it pretends to care. It purports that change is coming. It looks to improvement. Then, as soon as something needs to actually change, the cause pops up and the condition takes hold. The cause is our inexplicable, illogical and mostly insurmountable AVERSION TO CHANGE. In short: we are shown a shiny New Thing. A better Thing. A Thing we want. We get so excited about the Thing. The Thing is amazing. The Thing is brilliant. The Thing will make our lives so much better. We must have The Thing. Then we are told what to do to get The Thing. And suddenly it just sounds like too much work. It sounds difficult. We would really prefer to not have to do anything differently in order to get The Thing. The Thing (and all its lovely consequences and improvements) must simply appear. And if it does not magically appear, we declare The Thing unnecessary, and not really all that exciting. There are so many challenges keeping South African wine from what we believe is our rightful place on the world wine stage. Should our systemic aversion to changing the status quo really be amongst them? So true. I could not agree more. We want change but we don’t want to work to achieve it. “Oh, we’d really like to sell more wine from the tasting room”. Ok. How are your staff? Are they trained well? Perhaps they should do some front of house/basic wine courses (CWA or WSET) to make sure they can be more effective in talking to guests about the wines? “Oh, but that’s going to cost money and take time. No. We’ll just continue with whoever we can get to work with us and hope for the best”. Similar with wineries who want to dip a toe into “building a brand” online, but then balk at getting proper social media or digital marketing people because “anyone can create a Facebook page”. Try getting a winery to do something that requires them actively changing a set routine, even if it’s just a tiny part of it, and see how quickly their enthusiasm for results falters. Our little company (Ex Animo) is proof that change can be envisioned and actioned. The industry is so, so different (mostly better) than it was ten years ago when I first visited SA, and even compared to what it was two years or so ago when we started. I was waiting for someone like you to pop up with their ZAR0.02. And thank you! So I’m going to start off by asking you for examples of what’s changed, because I’m going to venture a guess that we’re likely not thinking about the same types of issues. I have other examples, some which I’d share offline rather than in print but tell me the changes you’ve seen and I’ll probably agree with you on many of them. I never said we haven’t changed and won’t ever change. I just want to point out that change is avoided at all bloody cost in many, *many* wineries. I have to agree with David, reluctantly of course. I find your piece puzzling, Marthélize, even bizarre in its conclusions. If you’d made more specific examples, it would have been clearer what you’re getting at. And I confess I know nothing about tasting rooms. Do you mean that winery’s marketing hasn’t changed? That’s rather more specif than your generalisation? I do know that there’s probably no wine industry in the world that has shown as much willingness to experiment, to work – that has changed, in fact – as much as the SA one has – not only since 1994, but since 2004, and since 2014. At the higher level, particularly. Mass production is pretty stuck, as one might expect. So many examples – take a staid category like chardonnay and note how many producers are now at least experimenting with not inoculating yeast, or not acidifying. I reckon it must be hundreds compared with half a dozen 15 years ago. Not getting a Facebook page is insignificant to me compared with things like that. But then, I’m also not willing to change enough to get a Facebook page. Hi Tim (and everyone else). 1) Word count – elaborating on this sufficiently would have ended in a MW thesis rather than a WM post. 2) I work with 40 wineries, so highlighting specific examples could get me into trouble if someone thought I was referring to them – which in this case I can safely say I was *not* – pointing out a single issue from a single winery or arm of industry (marketing/sales/production) would not a good generalization make. 3) And this is the one: I wanted to see if anyone else recognizes this thing I’ve been noticing. And I KNOW that many have because I’ve had this conversation many, many times before with people working in many different roles. So, to clarify: I’m referring to very practical aspects of the industry. Not higher level. Not bigger picture. Not “overall progress”. I’m trying to point out the niggly issues that stand in the way of the wonderful plans we have for 2020 and beyond. You can have all the vision you want, if you don’t implement that from the ground up, you’re going nowhere. I’m NOT referring to winemaking trends. Or styles. Frankly, not referring to anything to do with winemaking at all. I’m talking about management, marketing, sales, tourism, tastings rooms etc. If I knew anything about finances, I’d probably have a go at that too. A very basic example is in the context of a tasting room. Surely you’ve walked into a tasting room before and had a great experience? Everything just so, staff knowledgable and friendly, good sales people without being pushy and generally just a grand old time. Now, think to a time where you’ve had the opposite experience: Borderline surly staff, complete disinterest in you or the wine, basically pours the wine in the glass and if you’re lucky they might read or rattle off whatever is written on the back label. Awful, right? This is a chronic problem for some places, even though their staff turnover rate is astronomic. New faces every month. So what’s the problem? The tasting room staff aren’t paid or trained properly. Why not? Because they’re “just students” and why should we invest time in finding good employees or money in paying them properly when we’ll only lose them again 2-3 months down the line? So said tasting room consistently offers an experience akin to root canal at your friendly local dentist. And make no mistake, there is a dread wailing and gnashing of teeth because WHY is our Tripadvisor rating so utterly dismal? WHY DON’T PEOPLE LOVE US? But when presented with the quite obvious solution, one is met with resistance. Couldn’t possibly do that. De ja vu. I think what I’m saying is that the WILL to do better is there. It genuinely is. But the execution…That’s where the problem lies.